How many times did she leave from our driveway in that black Camry? Today, so far away! 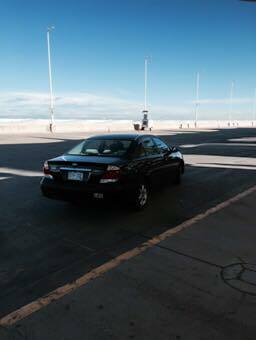 The black Camry bought for Mom in 2005 became Ann’s in 2007. 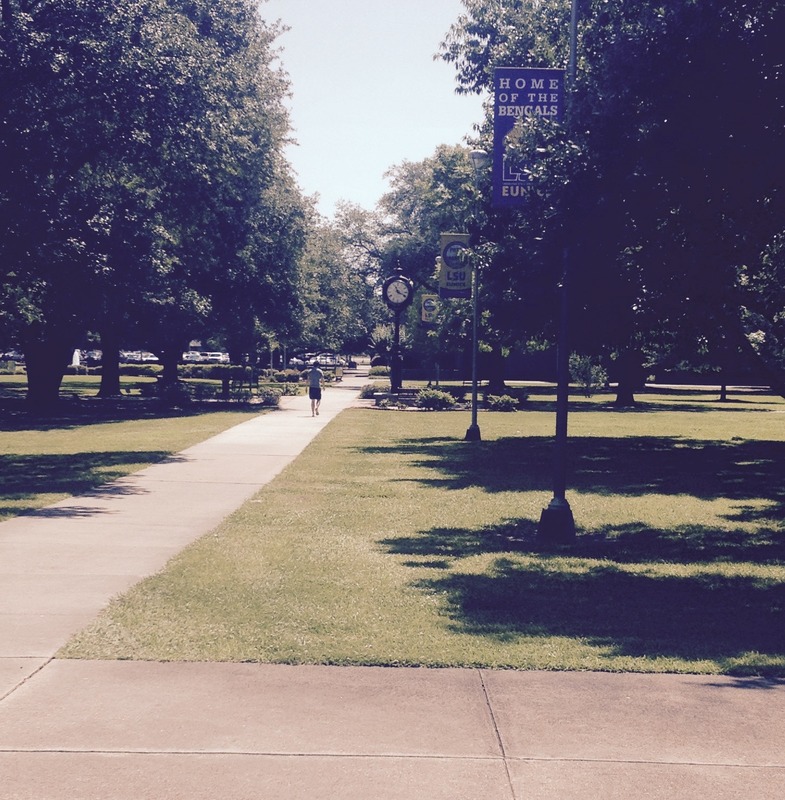 In the early years, we’d watch Ann drive away, southbound on Hill Street, to LSUE campus, where she was a student and trainer for the baseball team. She came back every day around the end of baseball practice. 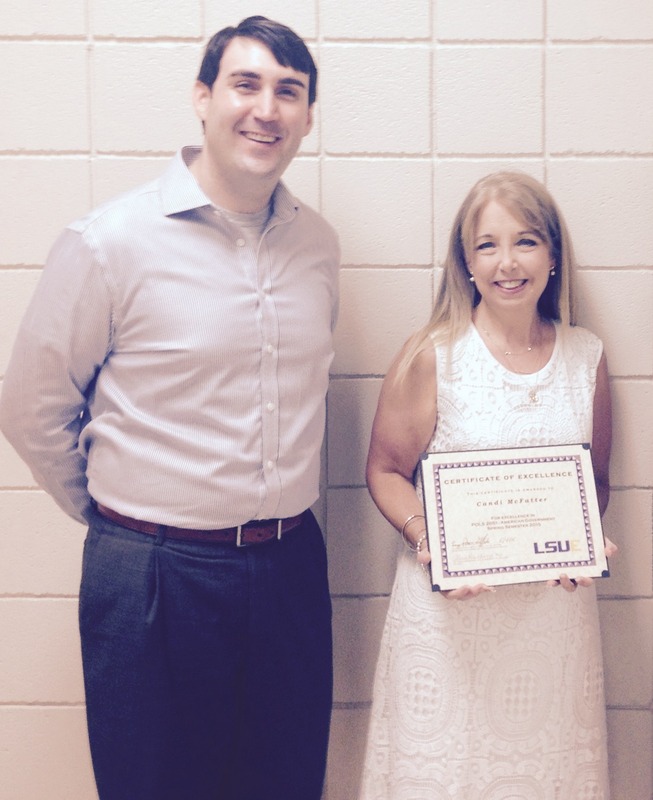 She earned the associate degree in 2009 and went on to LSU for her next two degrees. She returned mostly for holidays–that’s about all–but she came home at least 3 or 4 times a semester. We’d watch that black Camry drive away, northbound on Hill Street to US190 East, leading to the LSU campus in Baton Rouge. Then she grew up and got married. About 11 months ago, she drove that Camry off to Greeley, Colorado, to begin a career as a graduate assistant at University of Northern Colorado. That black Camry has never parked in our driveway since. So watching that car drive away today from the airport in Denver, after she dropped us off to catch our flight back to Louisiana, was a little emotional. Our little girl is all grown up. She drives off to a home of her own, far away from ours, as we fly off to what used to be her home. And thus we grow and go, kids and parents alike, navigating the cyclical courses of our lives. Nothing remains ever the same. Let me see if I can sort out the substance of today’s experience. Let me start with the beginning of this excerpt-from-my-life narrative. My former student who taught my former student. I’ll start with Patton. I taught Patton for English 1002 in the early 2000’s. He was a traditional-aged student from the area. I don’t recall the particulars of his performance, but I recall he was sharp student with a super-engaging personal style. He returned to LSUE as a teacher a couple of years ago and joined my office this past year as a full-time assistant administrator. 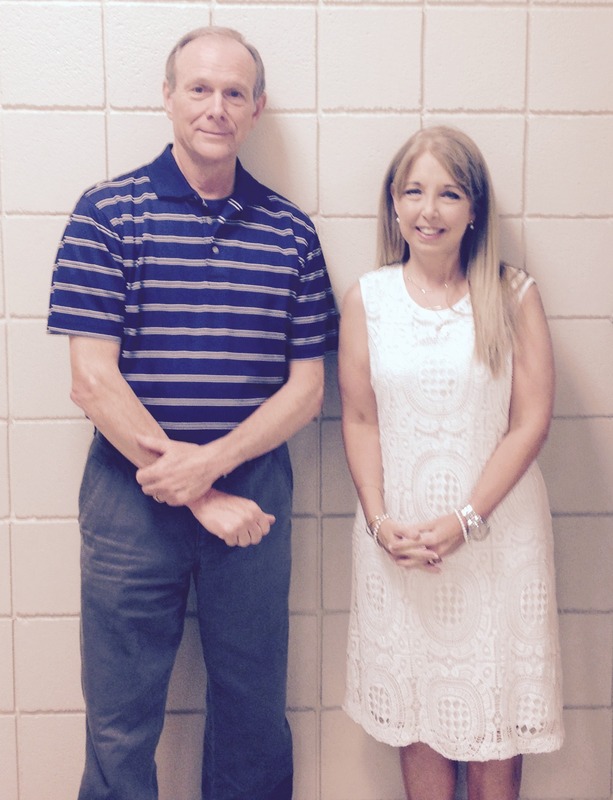 He’s picked up a couple of masters degrees since leaving LSUE and has become a really fine teacher, both for online courses and face-to-face courses. Next comes Candi. Candi was my student in 2008 in English 1002 online. She is a memorable student first of all for the quality of her writing and her overall effort. She really excelled at critical reading/researching/writing and earned one of the highest averages a student’s ever earned in my class. But English 1002 was not all that was going on in Candi’s life that semester. Her husband was terminally ill. She completed many of her assignments at his bedside at the M. D. Anderson Hospital in Houston through an unimaginably difficult and stressful (understatement?) life-crisis. Ever since, I’ve had little respect for students who come to me with lame excuses about why they couldn’t complete their assignments. Her work in that semester goes down in my 28 years of teaching as the most heroic student performance I’ve ever observed. Next comes Candi and Patton. One of Candi’s last courses in completing her degree was Political Science 2051, American Government. She took it this past semester, she excelled and earned an A, and her teacher was Patton. My former student teaching my former student. But that’s not all–Patton shared with me an email she sent to him at the end of this semester thanking him for being a good teacher and citing him and one other faculty member at LSUE as the best of the best teachers: The other faculty member she cited was me. A teacher never knows where his influence ends . . . or begins. Candi earned a certificate of distinction for her work in Patton’s class, so she came to campus today to receive her certificate and to take pictures. I was particularly pleased and proud that my supervisor and two of the academic Division Heads were present for the informal presentation, so Patton and I both got to brag and show off a little in front of our boss and our colleagues. I can’t spend the pride that I felt this morning at the grocery store, but like so many other rewards of teaching-as-a-life’s-calling, I’ll cherish the sentiment as long as my mind works. And of course, I memorialize it with this post. And to my friends who teach, we remember: This is sacred work! An empty, broken-down bus was the emblem of defeat. This post is pretty much a one-pic photo essay. If you ask a Hinds baseball fan, the broken down Hinds Community College bus loaded on the dolly this morning on our campus was supposed to have been driven home to Mississippi last weekend hauling a triumphant, nationally ranked first place Eagles baseball team back to Mississippi to the accolades of adoring fans prepared to root their boys on to the National Junior College Athletic Association World Series the following week in Oklahoma. But three unanticipated events spoiled their glee . . . and their ride home. 1. The number 1 ranked Eagles lost their first-round game in the Regional tournament to our then-second-ranked Bengals Friday night, 10-6. 2. The Eagles lost their double-elimination game the following night to those same Bengals, who white-washed the Mississippi boys 6-0. 3. The bus that would have hauled the triumphant Eagles back to Mississippi broke down and had to sit on the LSUE campus for a couple of days waiting for the king-sized tow truck that came today. As I watched the wrecker-driver securing the bus on the trailer, I thought, “What an emblem! What hubris!” The Eagles came to Eunice so confident; many of their fans were brash and outspoken, even after losing the opening round. Yep, we observed an example of pride that goes before destruction. This morning, the disabled bus’s emptiness at the beginning of its long ride home was emblematic of the team’s and its fans’ bitterness. As there was no joy in Casey’s Mudville, so there was no joy in the Eagles’ Raymond (Mississippi). The table in the Bogalusa church fellowship hall last Saturday was spread with a tempting array of hors d’oeurves and snacks. The hostess ladies of the Sunday School class had surely outdone themselves in preparing a spread that was as plentiful as it was varied. The most unique fare on display was the sushi-looking pinwheels shown in the picture here. At first sight, I was certain that it was sushi. Had the stuff actually been sushi, I never would have tasted, because I’m at odds with sushi. If acquiring a taste for sushi is the requirement for liking the stuff, I’ve given it fair opportunity, for I’ve gone along with the kids to sushi joints several times in recent years. Rather than aiding the acquisition of a taste for sushi, though, those experiences have confirmed and hardened my distaste. But when I remarked to someone Saturday afternoon about the resemblance of the pinwheels to sushi, she informed me that it was not sushi at all, and that it was quite good. So I tried a slice and loved it. I refilled my saucer 3 or 4 times the rest of the afternoon, gobbling the bite-sized treats one after the other, almost like popcorn. 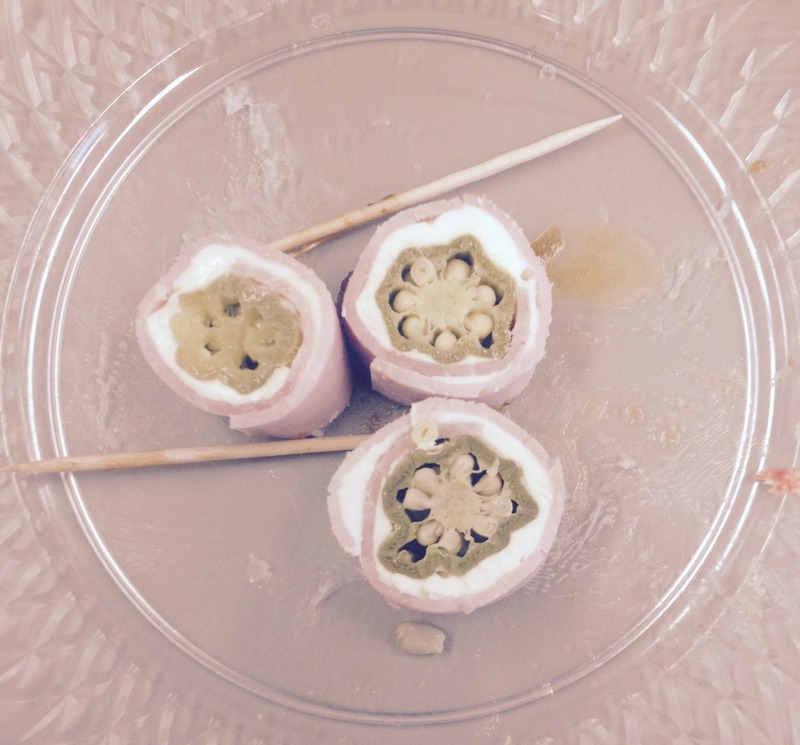 The deceptive sushi-looking ingredients turned out to be pickled okra in the center wrapped in a middle layer of cream cheese wrapped in an outer layer of ham. Aha! Deep South sushi! Better yet, Bogalusa sushi. Anyone famiiliar with south Louisiana culture knows that true sushi aficionados would never make the folksy burg of Bogalusa a destination for gourmet sushi tasting. But for sushi-haters like me, Bogalusa would be one of the most normal and trusted places to seek out a down-home variation featuring Deep South staples like okra and ham. Way to go, Sunday School ladies from the hardwood-covered hills of Washington Parish, way down yonder in southeast Louisiana, where they may not know sushi, but they do know good taste! We shopped at Rouses Supermarket in Lafayette on el cinquo de mayo (or however it’s spelled). The young cashier–obviously an American in her late teens, student-aged—-made friendly small talk in asking us if we were going to a Cinquo de Mayo party later that evening. I decided to ham it up a little, so I spoke a few random lines of Spanish–it had to be a few, because I’m not fluent in Spanish. But doggone it, this young lady answered me in Spanish! So I waded in deeper, “Habla usted espanol?” (Do you speak Spanish?). She replied, laughing, “Oh, No es mucho, es muy pocito” (Oh, not much, it’s very little). The answer, no surprise: “Oui.” SHe explained that she went through the Calcasieu Parish immersion program. I’ve rarely met teen-aged American kids who were fluent in French. Regrettably, in 28 years of teaching in a hard-core Cajun area of Lousiana, only one of the hundreds and hundreds of the local students I’ve taught could converse in their parents and grandparents’ native tongue. And I taught that student in the late 1980’s—-none since. But the two American teen-agers I’ve run into in and around Lafayette, Louisiana, in the last couple of years who could converse in French—-this cashier at Rouse’s and a young fellow in a Cajun music jam session spring-before-last—-were both the products of French immersion in public schools. I’m a believer! If spoken French in Louisiana is to persevere, immersion will play a major role. Regrettably, the students are learning standard as opposed to Louisiana French, but that’s better than no French at all. If they can get the linguistic foundation, there are enough archives now of Louisiana French in recorded media for some of them to study and compare. And, since language evolves whether we like it to evolve or not, language changes anyway. Better to have any kind of French than no French at all. 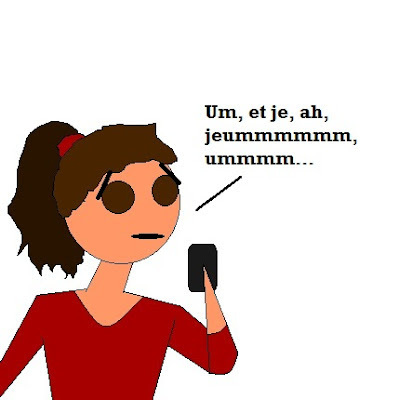 Ah, oui, nous-autres, on doit préserver le français! The campus is quiet for the last class on the last day of the last semester. The sentiment expressed in the title settled in my thoughts this morning as I walked across campus on this sparkling spring day, the last day of classes for the 2015 spring semester. Not counting the summer session, today marks the last of the last! I recall the years I first started teaching in public school when May’s advent portended the end of the school year. The strain, travail, and stress of the previous eight months waned and faded in the anticipation of an end to things. In that season every year, I started feeling an endorphic euphoria as the release of school year’s conclusion approached. When I moved into higher education as an administrator in 1997, the end-of-year euphoria vanished as May blended seamlessly into June, June into July, July into August, and so on. No ends in sight. Until now. The end is not quite as close as the first of June, because I have two months, three weeks, and 5 days into the summer to go. Nonetheless, this last class of the last day of the last semester feels like 25 years ago when the end of a school year really was an ending.